Ever wonder when you are at the beach that all of a sudden winds seem to come out of nowhere on a perfectly sunny day? NOTE: The term “Coastal Carolina Ridge” or “default coastal ridge” is just a general term used to describe an event that occurs naturally along the curvature of the GA/SC border coastline climate when one dominant feature runs its course, and then the typical Sea Breeze feature takes over (either for a small period or for the remainder of the day or night). In this case, was just a smaller period event, but definitely worth noting. 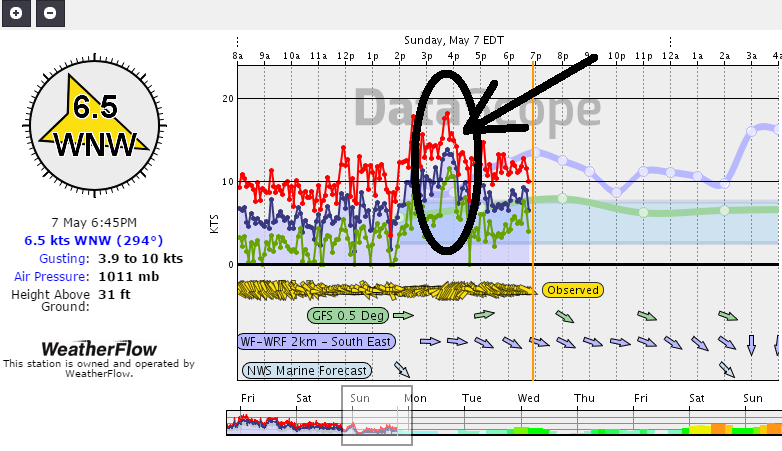 This event on Sunday, May 7th during the afternoon hours shows what happens when background winds (in this case Westerly winds) fall below a certain point while fading quickly as they head offshore. Just another one of those tricky nuances along the coast we constantly watch for in our forecast efforts. Stay safe all!